» Buy One Get One Free Tickets to the Movie WonderPark! Home » Freebies » Buy One Get One Free Tickets to the Movie WonderPark! 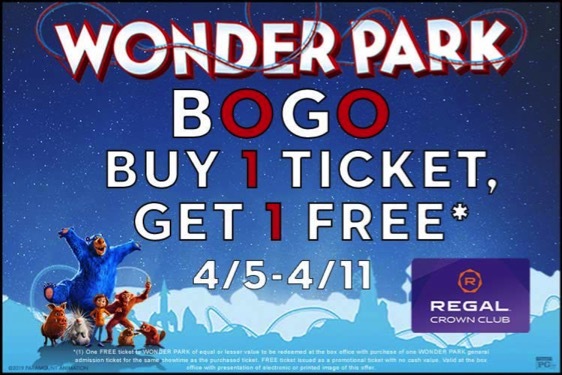 Regal Theaters is offering a buy one, get one free deal on movies tickets to see Wonderpark April 5-April11! Use your Regal Crown Club card at the box office when you see Wonder Park 4/5-4/11 and get an additional ticket of equal or lesser value to the same showtime for free! Buy tickets in advance or find out more HERE. This entry was posted in Freebies, Kids and tagged kids. Bookmark the permalink. ← Vendor Fair, Raffles and the Easter Bunny- Sunday!